In the latest government blow against rampant Medicare fraud, two doctors and a registered nurse in New Orleans were given stiff prison sentences and millions of dollars in fines this week in federal court for their roles in a long-term $50 million scheme. The trio and a fourth defendant were convicted of submitting roughly 8,000 fraudulent Medicare claims over a six-year period for referring patients to Memorial Home Health Inc. and three other “sham companies” for “medically unnecessary” home health services and treatment, according to a federal indictment reported by The Times-Picayune. In many cases, the treatments were never rendered. The blatant rip-off of the federal health care program for seniors in New Orleans would be startling if it wasn’t for the fact that it has become almost commonplace throughout the country. In 2014, federal authorities recovered roughly $5.7 billion in healthcare fraud cases, or $1.9 billion more than recovered the prior year. Of that amount, $2.3 billion was linked to healthcare fraud against the federal government, according to a recent review by the firm of Bass, Berry & Sims PLC in Nashville. "This marks the fifth consecutive year in which healthcare-related recoveries exceeded $2 billion – and that doesn't include state recoveries for Medicaid fraud. We don't expect this enforcement trend to slow down any time soon. In fact, all signs point to increased enforcement in the year to come," Brian D. Roark, head of the firm's Healthcare Fraud Task Force, said in a statement. As it draws to a close, 2015 is likely to be another banner year for Medicare and other health care fraud, according to the Justice Department. There has been a host of major fraud news this year involving dozens of individuals amounting to millions in abuse, often related to Medicare fraud. Earlier this year, Attorney General Loretta E. Lynch and Health and Human Services Secretary Sylvia Mathews Burwell announced a nationwide sweep led by a “Medicare Fraud Strike Force,” The federal crackdown in 17 regions resulted in charges against 243 doctors, nurses and other health professional for allegedly taking part in Medicare fraud schemes involving $712 million in false billings. As of Sept. 30, the strike force had taken 1,387 criminal actions producing 1,977 indictments and involving $1.8 billion of fraudulent activity, according to the Department of Health and Human Services Inspector General’s Offices. The crimes ranged from the owner and operator of a Detroit-area home health care agency directing a $7 million health care fraud operation to two New York medical clinics conspiring to cheat Medicare out of $55 million to a $3.4 million scam perpetrated by the owner of a Houston durable medical equipment business. Lynch said that there has also been widespread fraud in claims filed under the Medicare Part D prescription drug program. But the feds are not only moving on the criminal front to ferret out Medicare fraud and abuse. The cancer-treatment company 21st Century Oncology Holding Inc. has agreed to pay $19.7 million to settle a Justice Department civil complaint charging that its doctors performed a bladder-cancer test on seniors “more often than medically necessary,” according to a report on Thursday by the Wall Street Journal. However, the company is neither admitting nor denying wrongdoing, according to the report. As the government’s health care and prescription drug costs rise sharply, the Obama administration and members of Congress have grown increasingly troubled by the epidemic of fraud and improper payments that is draining the government’s health care resources. The Office of Management and Budget earlier this year announced stepped up efforts to root out fraud by beneficiaries and health care service providers, but that won’t be easy. The Government Accountability Office recently confirmed that Medicare and Medicaid fraud and overpayments continue to spin out of control. In fiscal 2014 alone, 22 agencies approved improper Medicare, Medicaid and Earned Income Tax Credit payments that totaled $124.7 billion—an increase of $18.9 billion or 15 percent from the previous year, according to the new report. 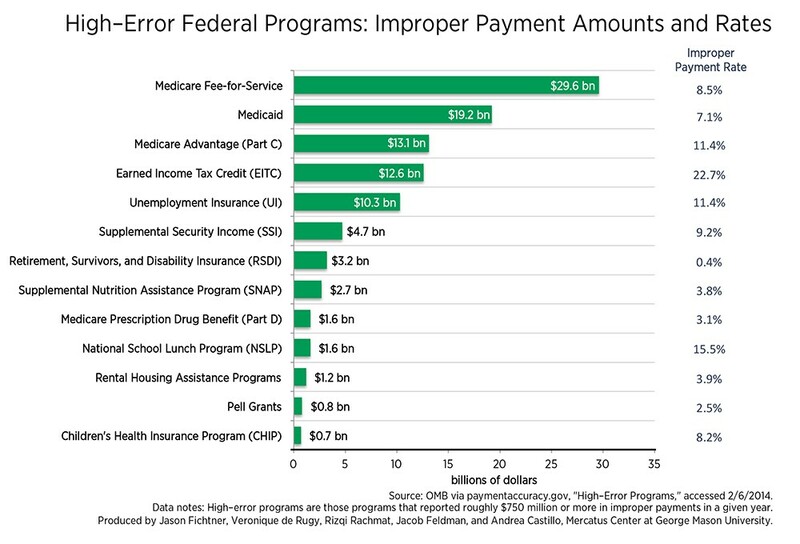 Those overpayments accounted for over 75 percent of the estimated government-wide overpayments or improper payments. Federal spending on Medicare and Medicaid, the two major federal programs to provide health care to seniors and the poor, is projected to rise in the coming years, making it critical that the White House and Congress find a way to thwart corrupt practices within the health care system. According to HHS, Medicare spending grew 5.5 percent to $618.7 billion in 2014, or 20 percent of total national health expenditures. Meanwhile, Medicaid spending grew 11 percent to $495.8 billion in 2014, or 16 percent of total national health expenditures.